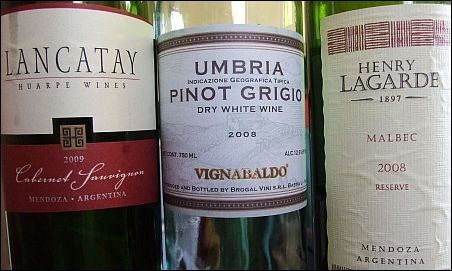 Over the last few months (probably about four) we’ve sampled a few bottles of wine: a 2009 Lancatay Cabernet Sauvignon (Argentina), a 2008 Henry Lagarde Malbec (Argentina), and a 2008 Umbria Pinot Grigio (Italy). Both of the Argentina reds were excellent, had tasty, bold flavor, and packed a bit of a punch alcohol-wise too. The Italian Pinot Grigio was actually a bit too mild in flavor for either of us. The bottle we had seemed a bit on the light side taste-wise. Sorry I can’t be more specific – next time I’ll try to post about the wine within a week of having tried it, instead of months, when I can’t remember many details! In any case, we’d both recommend either or both of the Argentina wines if you’re up for some robust reds.